Mornings can be rough, and even the most diehard skiers experience days when it’s hard to get out of bed. You cringe at the thought of jamming your bruised feet into your wet-from-yesterday ski boots, and all you want is to pull the blanket over your head and snuggle into the depths of your down comforter. Last year I skied 2.5-million human-powered vertical feet, and there were definitely times when I just didn’t feel like skinning. I often wanted to ski one less run or even lay down in the snow and cry. But I knew that, to reach my goal, I had to become a master of motivating myself to start earlier, go longer, go faster and stop later. I came up with tricks and tools to keep my motivation up, and I never regretted skiing more. Here’s what I learned. The easiest way to be motivated for a morning dawn patrol is to pick an objective with high “wahoo” factor. Deep snow, a short approach and a scenic route are always a plus. When the tour plan calls for a five-mile skin on flat terrain through dense tree cover, it’s going to be harder to set an alarm. Add variable snow conditions to the mix and you’ll be pressing snooze until next week. One of the tools that’s been most successful in boosting my time-spent-to-fun-had ratio is setting season-long goals. At the beginning of the winter, I spend time thinking about what I’d like to achieve during the coming season. These goals often include the number of days I wish to spend on skis or the amount of vertical feet I hope to climb. But I have friends who are less numerically driven, and they set different types of goals: pushing to ski things that scare them, skiing every month of the year or skiing in a new location at least once each week. It’s up to you to find and set goals for yourself that you truly want to achieve. The motivation will follow. Grand goals are just the sum of their parts: smaller goals that, over time, have a big impact. And when it comes to setting small goals, the simpler the better. When I was exhausted last year, I would pick a tree 100 feet in front of me and just try to get there. Then I would pick another tree and aim for that one. Before I knew it, I was at the summit and ready to reap the rewards. Small, easily attainable goals—stacked one on top of another—soon become successful big goals. To find the right partner, you must first know yourself. Learn what type of skier you are. Do you like to go light and fast? Do you like to bring a big, heavy ski and frame binding and huck on the way down? Whatever it may be, know yourself and pick your partners accordingly. If my goal is to climb as many vertical feet as possible, there are some touring partners I would never ask to join in on my mission. On other days, I may want to explore a techy line, and I’ll probably call completely different people. I know that each of my touring partners makes the same call when they decide whether or not to invite me on a tour. This may seem insignificant, but it helped me wake up and be a better touring partner. If I’m all ready to go in the morning, I can sleep a bit longer and roll out of bed faster because I’m not stressed about tracking down clean socks, and I show up on time. 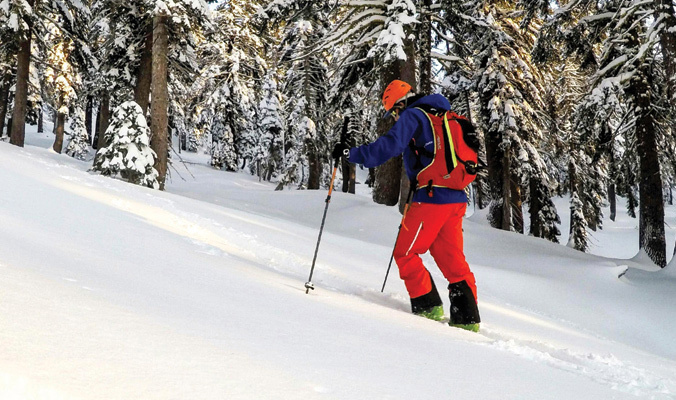 A skimo race may sound intimidating, but there’s so much to gain from doing just one. Many ski towns have a citizen-series weekly race where all levels are welcome. I remember the first skimo race I attended: I got crushed. In the hour-long race, I took off my pack at each transition to store my helmet, goggles, skins and layers. Meanwhile people were flying by me with packs never touching the ground. For me, the takeaway was not to buy lighter gear and get Spandex to shove my skins into, but rather to change my mentality. I realized that I needed to learn to rip skins with my skis still on, to kickturn correctly, to travel through the mountains efficiently and to use that knowledge in the backcountry to be safer, have more fun and ultimately ski more. The best way to have a failed day is to pick just one objective and get shut down. While skiing in Colorado one spring, a good friend taught me to always have a plan B, C and D and to make sure that each of those plans is almost as good as plan A, if not better. When plan A falls through, the stoke remains just as high. Then, after the day is over, you can look back at the great time you had and not on a catastrophic slog, which will keep you excited for tomorrow. Bottom Line: After nearly 10 years of backcountry skiing, I’ve learned that the only way to stay motivated is to have fun. Most of my tricks just facilitate a good time. If you’re doing the thing you love, you’ll be motivated to do more of it. All of the tactics for staying motivated to ski can apply to anything you do in life—if we have fun with the people we want to be around, our lives will be enriched. This week, videographer Tyler Wilkinson-Ray premiered his film 2.5 Million, a Banff Mountain Film Festival select that documents Aaron Rice’s journey to ski 2.5-million vertical feet in 2016. The film, a Banff Mountain Film Festival select, is now available to viewers. To learn more about the project, visit airandrice.com. Mountain Skills: Should I Stay or Should I Blow?